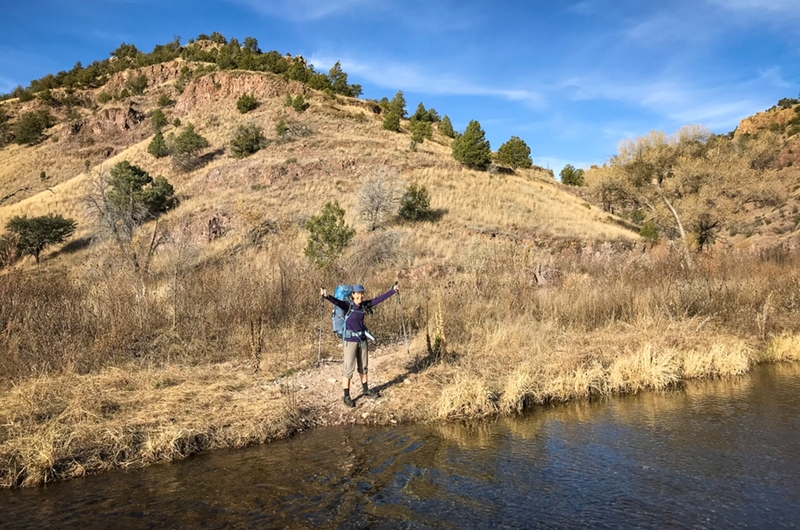 After tackling 490 miles on the Colorado Trail this past summer, it’s been an awfully sedentary fall for the two of us, and we’ve been itching to hit the trail again and taste the freedom of the outdoors. 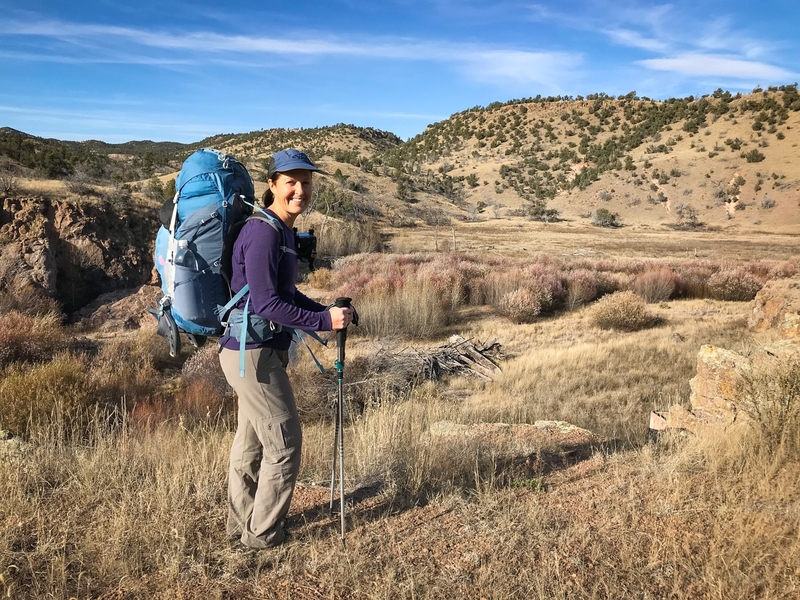 With a week off over Thanksgiving, we were looking for a backpacking destination in the US that would offer a challenging multiday experience and still be warm enough for camping in late November. Our first choice was the Grand Canyon Rim to Rim Trail, a classic hike that’s still on our bucket list, but, unfortunately, we were too late this year to secure a permit. Where else would work? 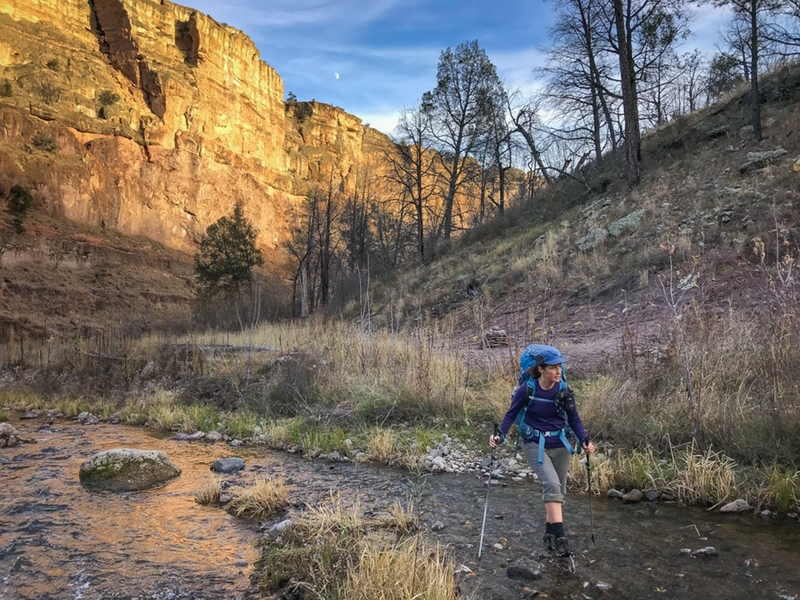 We recalled that a couple of trail angels we met last summer were from New Mexico, and they told us about the excellent backpacking they often did in the Gila Wilderness. 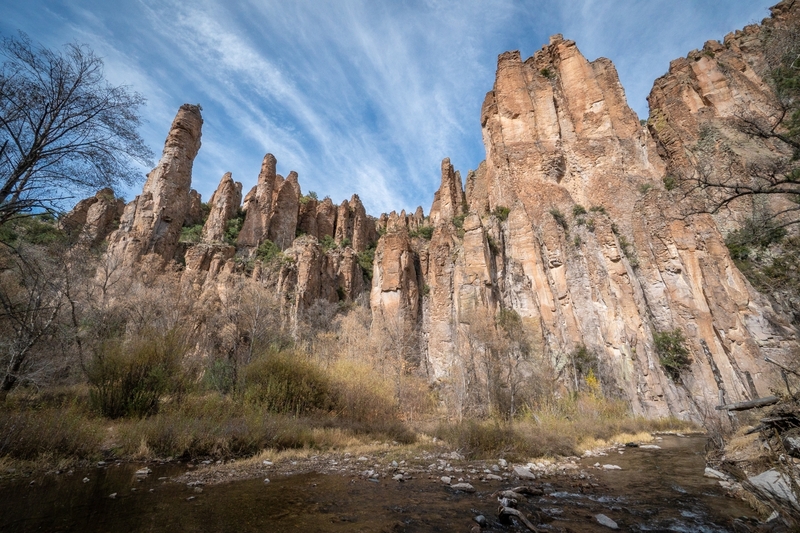 We had never heard of it, but a little googling suggested several options for loop hikes of varying distances leaving from the Gila Cliff Dwellings National Monument. We arrive in Albuquerque late on a Friday night and make our way to a nearby motel to stay the night. We’re up early the next morning and make a quick pit stop at a nearby Walmart to pick up stove fuel and a few last-minute food items. 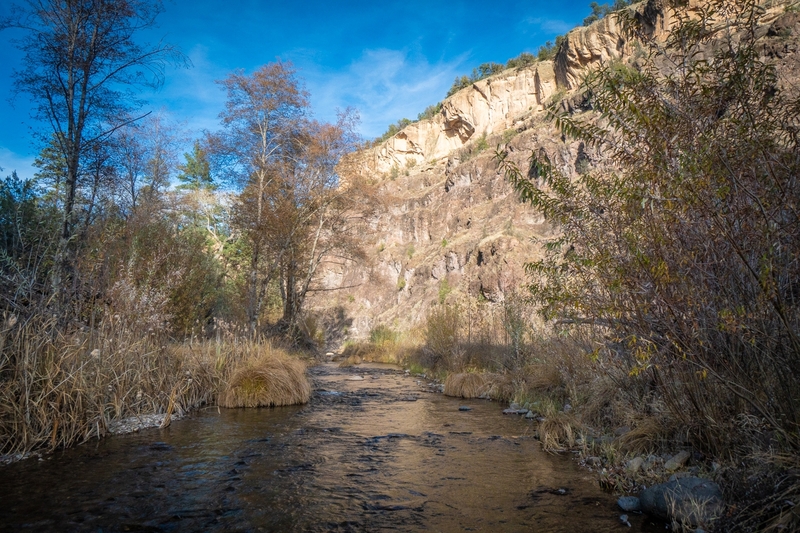 We hit the highway for the five-hour drive south to the Gila Wilderness. Some of the journey is on interstate highway, but once we turn off I-25, we find ourselves on windy narrow roads that twist their way through canyons, gradually gaining elevation in the high desert country of southwestern New Mexico. We pull into the Gila Cliff Dwellings Visitor Center well past lunchtime to inquire about current trail conditions. The friendly ranger tells us that the trail is in decent shape and wishes us luck on our adventure. It seems strange not to register our car or leave notification of how many days we intend to be out. 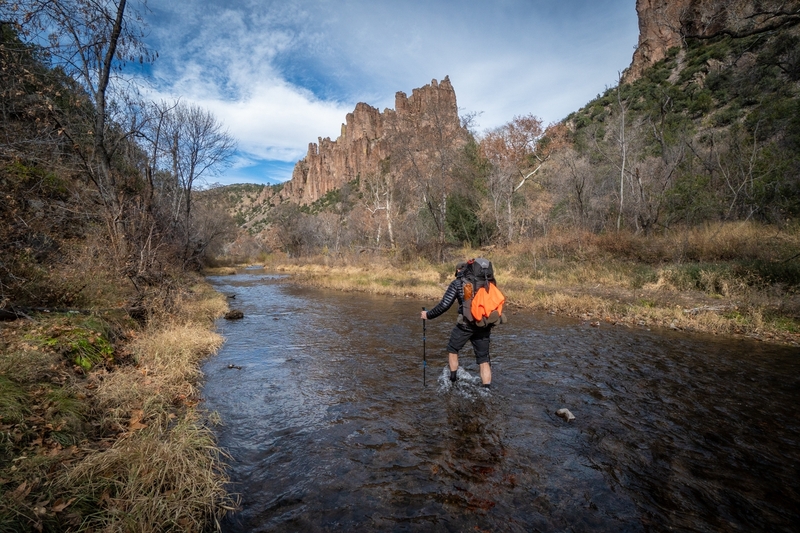 The main challenge of this route is that the hike involves numerous river crossings. The upside is that November is a good time to hike here because of manageable water levels and a reduced chance of rain or flash flooding. The downside is that the days are short, the nights are cold, and the water temperature is quite brisk. We are also aware that it’s hunting season in these parts and that elk are often seen grazing in the area we will be hiking in. As a precaution we wear bright orange stocking caps and hang orange vests on our backpacks to help prevent being mistaken for animals. Two vegetarians hiking in the woods don’t take anything for granted. Within a few minutes, we pass two day hikers on their way back to the trailhead who give us a double take upon spotting our backpacks. They barely manage to hide their sarcasm as they say, “Have fun.. er… camping.” Another half-mile down the trail, we arrive at Lightfeather Hot Springs, where we find a couple with a young daughter soaking in the shallow, warm rock pools at the edge of the river. It would be fun to join them for a bit, but our late start isn’t leaving us with any time for extras. We need to make some miles before the sun goes down, so we settle for a quick step in the hot pools to warm up our toes before pressing on. 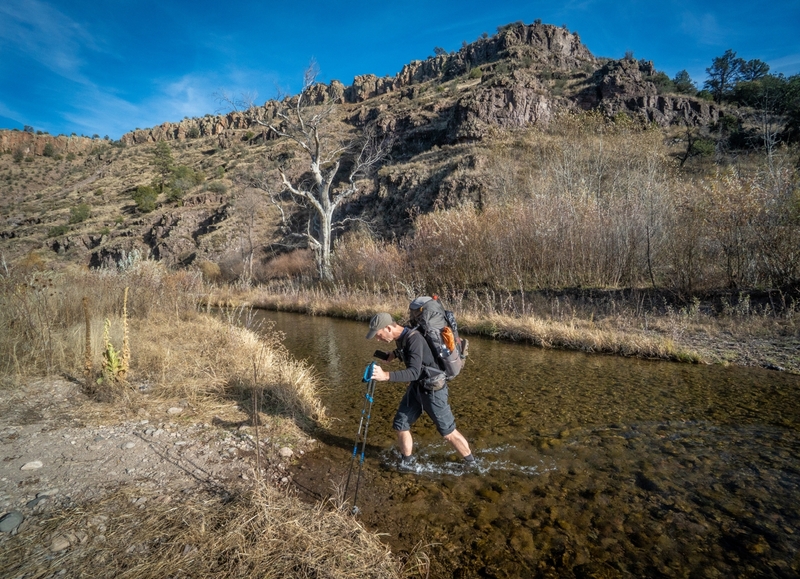 A dozen river crossings later, the hot springs are a distant memory as we make our way deeper and deeper into the shaded canyon of the Middle Fork. As the sun goes down, the temperature is dropping noticeably, and we begin having second thoughts about all this time in the water. The cold feels even more intense where we are wet. Luckily, none of the crossings are deeper than mid-calf, but the river is quite rocky on the bottom and quite slippery in places. Our poles come in handy and help to keep us upright. When we are on land, we focus our attention on how the late-afternoon light plays on the canyon walls to keep our minds off our freezing feet. As soon as we arrive, we scramble to get out of our wet shoes as the temperature plummets. We hustle to complete basic chores: trade sweaty clothes for warm layers, filter water, set up the tent, and gather firewood. 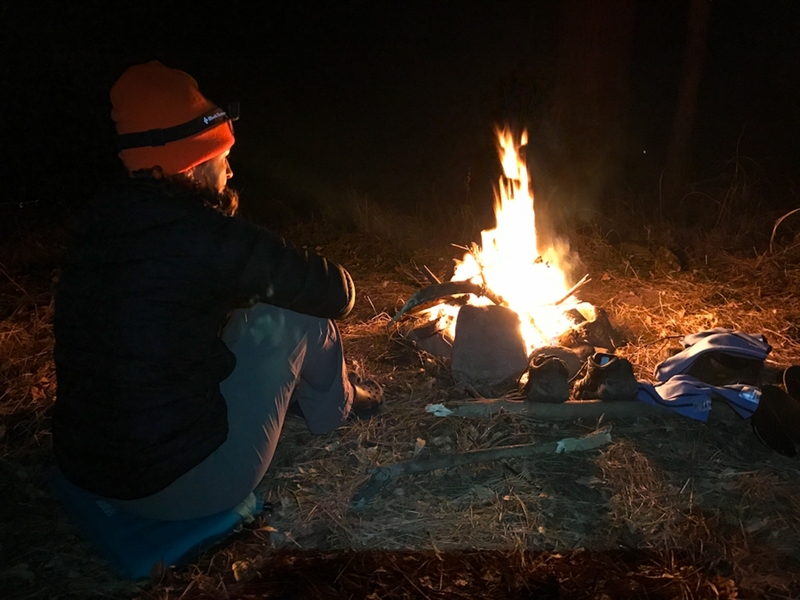 We are not usually keen on building fires, choosing instead to focus on photography and writing, but we figure it’s only 5 p.m., and we’ve got to find a way to stay warm and out of our tent for a few hours before heading to bed. Even so, all the fresh air has us worn out and we are ready for bed. We hang our bear bags away from camp, climb into the cozy confines of our tiny tent, and bid each other good night before cocooning deep in our sleeping bags. Our new luxury item for this trip is a pair of ultralight goose down socks by Zpacks, which are basically sleeping bag booties for our feet, and they are nothing short of heaven! Both resources were extremely helpful. If you have any other questions, please let us know!